 A telling look into the pained hearts and confused minds of the mentally ill, by the author of The Dinosaur Man (1991). Baur operates in the belief that psychotherapy is a way of helping patients learn to construct better stories about their lives--more complete, coherent, and convincing stories that, in reinterpreting their pasts, also open up new paths for the future. This isn't a new theory, but she illuminates it by relating her attempts (not always successful) to do therapy with severely ill patients: the delusional, the hostile, the hopeless. Not only does Baur try to help her patients become better storytellers, but she, in her role as therapist, also exemplifies the art of listening at its best, finding the sense underneath seemingly incoherent ramblings. Her patients include suicidal Charlie Isabella, who tantalizes her with his gentle but rare smile, and Angie Savalonis, a wild woman who years earlier had lost her boyfriend in a motorcycle accident. 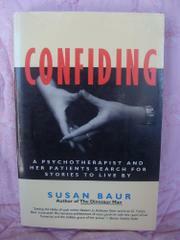 But two-thirds of the way through her book, Baur veers off into a polemic against current modes of treatment-- or mistreatment--of the mentally ill by therapists who impose their own stories on patients, labeling them ``aggressive,'' ``schizophrenic,'' and the like, instead of sounding out the source of their individual pain. Although she raises valid, even disturbing, issues, Baur loses her readers when she categorizes such patients as ``eccentrics'' rebelling against society's strictures. In the end it is the patients themselves who command our attention, for the almost poetic, and sometimes remarkably lucid, ways they have of describing their own torment. Frenetic T.M. bemoans the ``black crab nebula death'' that awaits him; institutionalized Rosina Venuto writes, ``I pray, but God is too smart to hang around this place;'' Lloyd Bartlett, semi-aware that his world is peopled with fantasy characters, says, ``It is extremely disconcerting to doubt the contents of your own mind.'' Better when practicing than when preaching, Baur is insightful, compassionate, and wise.